North Georgia Zoo & Farm is home to all kinds of farm and exotic of animals. We offers more options than a traditional zoo. We do this to help fit your schedule, dreams, ages and budget! We also specialize in close encounters & personal interactions. Come experience for yourself and see why we are called a "Zoo like no other" and why you will love #MyFavZoo! Tickets can be purchased day of at the ticket booth, however we do recommend arriving early to insure availability. **Taxes and fees apply when purchasing tickets online. Charges on your receipt & bank statement will show from Wildlife Wonders. Visit, feed and interact with tons of miniature and rare breed farm animals! Petting Farm only: $8 adult / child $6 *Can be purchased at ticket booth. Can be purchased day of at ticket booth, please arrive early to insure availability. Feed the friendly camels! No spitting here! Take a wagon ride up to the ridge and view even more animals as your guide tells you all about them. Animals include: Water buffalo, Yak, Highlander Cows and Camels! The highlight of course is getting off the wagon and visiting with our friendly and famous camels! Approx 35 minutes. *150 lb Python *Giant Tortoise *Monitor Lizard*Alligators and Crocs *Tarantulas *Giant Frog*Chameleons *Dragons, Iguanas & More! Includes: Wildlife Walk, Camel Encounter, Reptile Encounter & Petting Zoo. Do you love adventure? Sign up for our Adventure Package and get to do everything from touch a snake, howl with the wolves, hand feed a camel and more! 1 Free feed cup included! 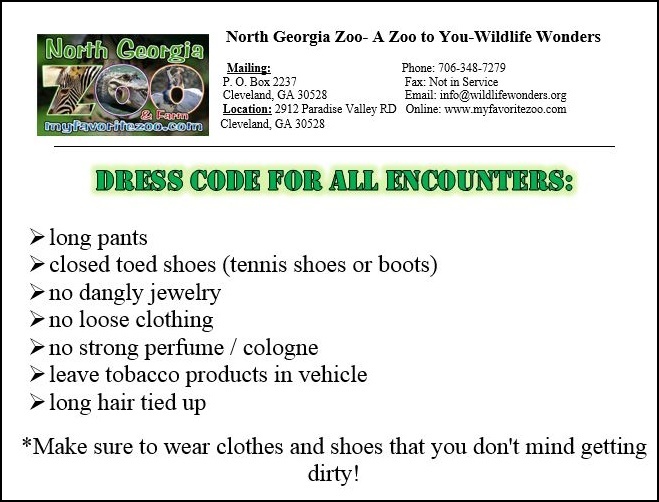 Includes: Wildlife Walk, Camel Encounter & Petting Zoo. Allow around 3 hours for these activities! Check out all our amazing animals! Take a wild tour where you'll get to meet exotic animals, hands on presentation at the end! Hand feed the camels, see some adorable mini farm animals in our petting zoo! Saturdays at 10:15am. This must be reserved other wise it does not run. Perfect for families with little ones! Take a shortened- guided walking tour, learn a few fun facts about some of our animals! Take a Zippity stop at the reptile house to meet, touch and feel about 2-3 reptiles. Then off to the wildlife stage where you will have some extended time for learning, touching and feeling some of our adorably small mammals & birds. Allow around 40 min. Walking Tour: around 20 Min. Hands on time: about 20 min. VISA, MASTERCARD,Cash & Personal Check with ID. There is a $5 minimum on all credit card purchases in lieu of a service fees. Discounted rates and options available for groups over 15. Advance Reservations required. Check out our options for Birthday Parties, School Trips, Scouts, Churches, Corporate Functions and more! paid off in less then 3 visits! Join our newsletter for coupons, updates on events and more! We can "BRING THE ZOO TO YOU"
ZOO TO YOU We bring the animals to your event. We do educational programs, petting zoos, nativity animals and much more. Wildlife Wonders- Zoo To You has been providing animals for outreach events for over 14+ years so you can be assured you will have the best animals, educators and experience! Many options, see our Wildlife Wonders site for details! Prices do not include admission. This is required for all encounters & experiences. Minimum age of 8 on most Encounters. Ages 8-11, an adult is required to pay & participate for the safety of the child(ren) and animals. Ages 12 and older do not require an adult to participate, but recommended to share the experience! Those wanting to view/ attend a encounter but not participate will be asked to pay 50% of the Encounter Price.